Whilst many customers choose TG Escapes to build additional learning space, our bespoke, turnkey capability means our modular buildings fulfil a diverse range of other functions. The highly flexible, architect designed, biophilic buildings offer a beautiful, inspirational solution to any number of space requirements and needs. With a fast turnaround time and minimal disruption to regular daily school life, they are a fraction of the cost of a traditional bricks and mortar building. 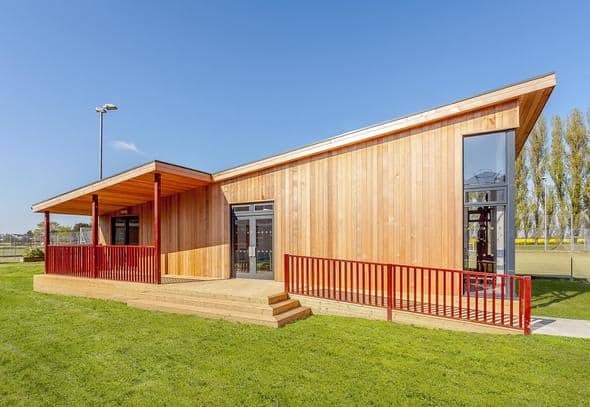 For most of our customers the standalone nature of a modular building is ideal for creating an oasis away from the hectic hubbub of the main school buildings, with the added advantages of utilising an unused corner of the school’s grounds and frequently freeing up much needed space within the existing buildings. We have found that these are six of the most popular uses, but there is really very little limit to what can be done! Each project here has it’s own case study so just follow the links to find out more. With floor to ceiling windows and sun pipes for maximum natural light, acoustic ceiling tiles and separation from the main school, a stand alone eco-building can make an ideal studio for music and the arts. Wavendon Gate School in Buckinghamshire wanted a dedicated music studio for instrument storage and lessons, to minimise setting up time and to insulate the rest of the school from the noise! The pupils love creating music as loudly and enthusiastically as they please whilst other lessons can continue in peace! In Oxfordshire, Swalcliffe Park School provides day and residential care for boys with autism. Their performing arts studio is set apart from the main school, the open outlook encourages less confident students to have a go and its standalone aspect allows the school to use the studio as an opportunity to forge links with the local community who use the building without impacting upon daily school life. A stand alone school hall, canteen or even a chapel, can relieve pressure in the main school building and create a unique space with a very special ambiance. After a significant rise in pupil numbers, Kymbrook Primary School had needed to convert its school hall in to additional classroom space. An outdoor school hall with the addition of a raised roof for racquet sports and a sprung floor for ballet has resulted in the perfect space for PE lessons, yet has also encouraged the children to get outside to play and exercise. 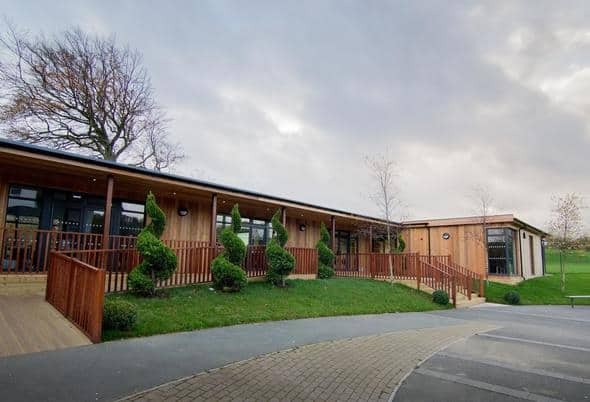 Another school that has enjoyed rapid expansion of late is St. Philip Howard, a Catholic High School in West Sussex, that was having to use classrooms for services. They now have a beautifully lit, peaceful and serene chapel in which to worship and seek solace from the demands of busy school life. Whether a school is a specialist SEND provider, or a mainstream school looking for purpose-built classrooms for a small cohort of pupils requiring special support, we are well versed in the extra learning space requirements of students with special needs. Hollywood Primary School found itself with very little time to prepare for the arrival of 12 autistic pupils and supporting staff: they were delighted with the speed and skill that TG Escapes were able to respond to their need for a dedicated SEN resource base. As a specialist college, Cambian Pengwern offer day and residential care for 16-25 year olds and were keen to take full advantage of the school’s wonderful natural setting. Their multi room building includes classrooms, a sensory room and specialist treatment room. The low stimulus environment has had a particularly notable impact upon the autistic learners. Similar improvements in pupil engagement have been reported at Rossendale School, another specialist SEN provider whose pupils are visibly enjoying the roominess and natural light in their new stand alone classroom block, making them feel both comfortable and valued. The extensive penetration of natural light into our buildings is a universal feature which also appeals greatly to customers providing Early Years nursery care. The design is also carefully crafted to encourage free-flow play between indoors and out, which combined with covered walkways and outdoors play areas, provides a naturally healthy and nurturing environment for a nursery’s tiny occupants. Again, our early years’ customers comprise both specialist providers and schools that wish to extend their educational provision to preschool children. For instance, St. Francis Primary School in Wiltshire was keen to offer local families much needed reliable and flexible childcare facilities for their preschool children. Their separate and secure eco-nursery includes 2 classrooms and office space. In Cardiff, St. Fagans School needed more space for individual SEN and small group learning, which they were keen to do within the main school building. 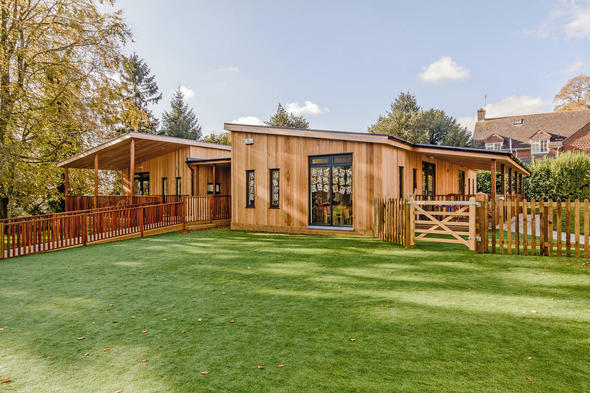 They took the decision to vacate the space occupied by their early years provision and build a bright, airy, standalone nursery unit in the school’s grounds in order to encourage more outdoor play. Specialist nursery providers, Angels by Day and Toad Hall, were both experiencing rapidly rising demand for places and needed a quick, disruption free modular expansion of their facilities. Both are delighted with their light and airy spaces and the opportunities for frequent outdoor learning, play and adventure. It’s not just the children that respond well to a well lit, biophilic learning space, teachers enjoy working a training in them too. Several of our customers have installed specialist teacher training centres on their school sites. Shotton Hall, a rapidly expanding multi-academy trust, needed a large multi-purpose building to accommodate new classrooms, much needed additional office space and a large teacher training facility. Sacred Heart was appointed as a national teaching school, following its outstanding OFSTED rating, and it needed to very quickly build a dedicated training centre. The result is a sustainable eco-building that sits beautifully within its leafy setting and provides a dynamic space for delegates to attend training courses without disturbing daily school life. Some want a straightforward set of changing and shower facilities and others want a sports pavilion with extra fixtures for users with special needs. Ruskin Leisure, a health and fitness facility with sports pitches for young and old, wanted to put themselves back as the sporting hub of St. Helens. A fundamental part of their ambition is their new, self-contained changing facility which contains numerous changing rooms for teams and officials, observation space for the scorers, eight shower areas and no fewer than twenty-five toilets! The Heart of the Forest Community Special School caters for students aged 3-19 with profound, complex learning needs and often significant physical disabilities. Their sports pavilion provides easy access to shelter, refreshments, changing and hygiene facilities for every conceivable level of need and allows every student to participate in the outdoor education curriculum. And there you have the six most popular non-classroom uses of our modular buildings. But there are many more from libraries to staffrooms and standalone catering and dining facilities, or even just a simple outdoor shelter in which to take the children outside for story-time on a hot summer’s day or for parents to take cover from the rain at the end of the day. Whatever your needs, we have a skilled and dedicated team that will listen to what you want, how much you want to spend and when you need your building to be ready. We will then manage the project for you, from planning and building regulations through to handing over the keys.